Notes: Only cash and nets accepted; order at the counter, nett pricing! So remember how I wrote in my original Krave review that I was dying to go back to this restaurant? Well I did, in a space of maybe 2 weeks, after unilaterally deciding that Krave was going to be the site of an iftar (breaking one’s fast) with some girlfriends! It is imperative to make reservations if you’re planning to break your fast at any of the halal places in Singapore, especially if they’re the hottest new kid in town – everyone’s going to want to eat there at 7:15 pm when the sun sets. 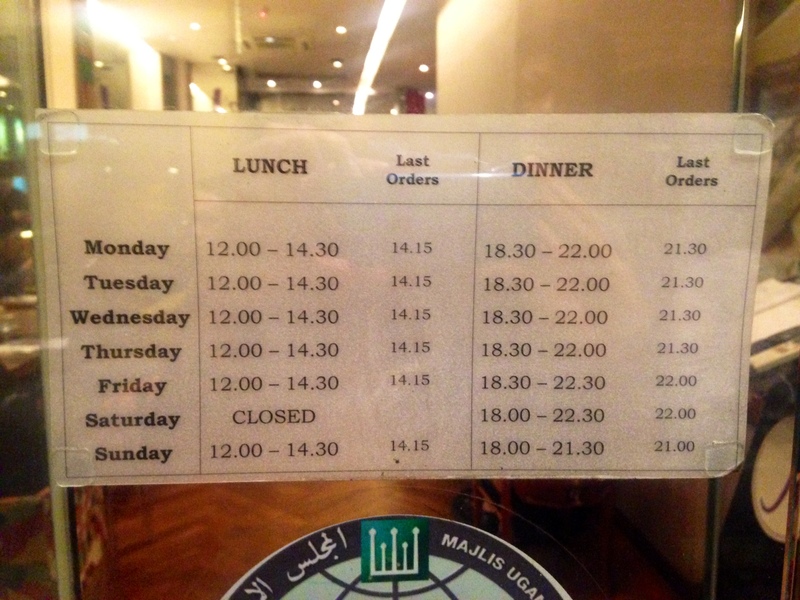 However, I think if you’re just looking for a quick dinner starting at about 8:30pm to 9pm, you should be safe. First off here are photos of the menu! I love that they have salad options on the menu, but let’s be real here; I’m never going to order them, in the presence of steak and all. It’s all about the smoothies here! Don’t even bother with the plebeian drinks. Krave’s iftar dinner edition came with a few extras that were very much appreciated – they had two dispensers of water and rose syrup drink (good old air sirap) for everyone to help themselves to, they prepared dates for diners to break their fast with, AND every table got a plate of assorted macarons after their main course! They really pulled out all the stops for Ramadan. I love these little touches; they go a long way in distinguising a restaurant from the rest of the pack. Yum. Everytime I look at plain un-bandung rose syrup drink, I’ll think of the classic 1964 hindi movie Sangam. There was a scene where someone made a pitcher of rose syrup drink, and my 5-year-old self was enchanted. The most amazing things to break one’s fast with – moist plump dates, and a cup of Gula Melaka Smoothie (S$8) YUMMMMMMM. Macarons are great but free macarons are better. I liked the earl grey chocolate and the lemon. !! A cash/nets sign made using Lego material! A cute personal message from the cash register! I tried not to get distracted and got most of the orders in. (Not going to lie, I had to go back to the counter a second time). A terrible photo of the display counter with macarons, assorted cakes, canned drinks, and rows of Chempedak Crème Brûlée waiting to be torched into deliciousness! On to mains – I was dying to get the Steak ‘n’ Chips (S$20) again, but I resisted and decided to try the infamous Kraving Ayam Bakar (S$16), so at least I could write a review on it. It came on a bed of sweet satay sauce and some cubes of lontong (rice cakes) on the side. One of my friends tried out the Ramadan special, which was the Rendang Bolognese (S$16). What is that sound they play when Pacman dies in the game? Another one of us had the Arrabiata Seafood Pasta (S$16), which came with a symphony of prawns, mussels, squid, and clams. Yum! I love shellfish, and it’s great that this dish had two kinds! For dessert, apart from the macaroons that the cafe had generously given us on the house, we ordered two ramekins of the Chempedak Crème Brûlée (S$8) to share. 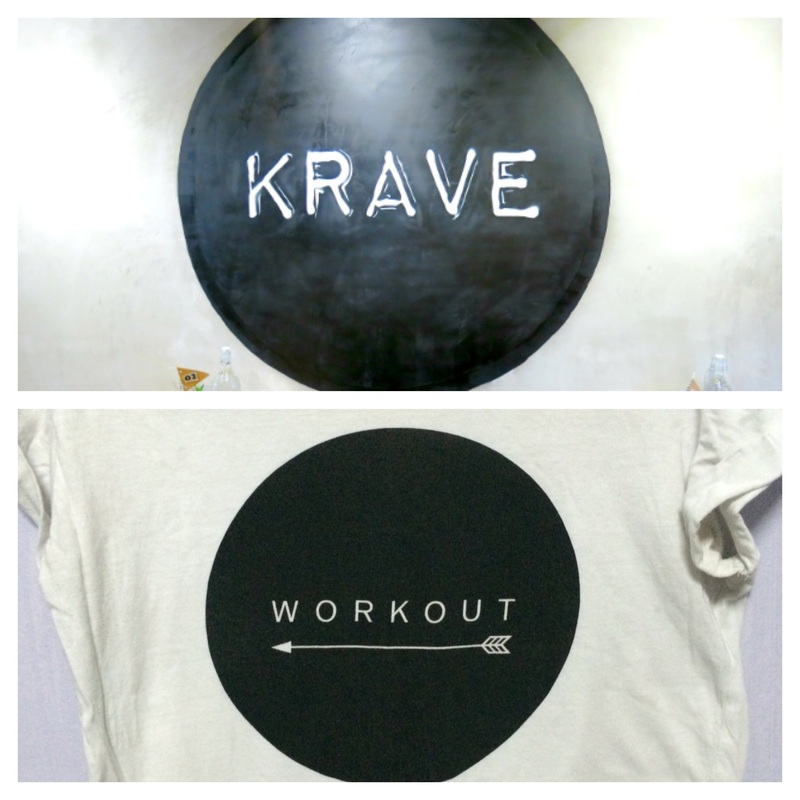 Overall Krave still remains a new favourite of mine; the ambience is casual, friendly, and safe. The staff are all smiles and will be more than happy to help you take photos of your table. They are also quite proactive in clearing the plates as soon as you are done with them. I’m definitely coming back for the steak again and perhaps try more of the sides (drumlets!) and the pizza. Notes: Order and pay at the counter; no GST and no service charge! For the past 2-3 years, I have been taking Arabic lessons at the Al-Markaz institute, located on the 2nd floor of Wardah books on Bussorah Street. Over the course of these years I’d forged a real bond with some classmates, and together we went for classes every Saturday morning from Modern Standard Arabic Level 2 to Level 7. These friends provided a great support system – texting me the homework that I had missed from the classes I’d skipped, sharing their grievances about the grammatical difficulties of Arabic, etc. Arabic is so tough; I cannot tell you how many lessons I’ve pontenged (skipped), only to regret it the following week when I have twice the amount of homework to catch up on. The struggle is very real, my friends, so I was thankful to have these folks to motivate me. Alas, all good things must come to an end. About 2 to 3 months ago, in an egregious act of betrayal, my Arabic gang decided not to advance to Level 8 with me, leaving me in the absolute lurch 😦 Luckily, they missed our teacher so much (he’s so amazing) that we decided to organise a reunion lunch together with him after class a few weeks ago. 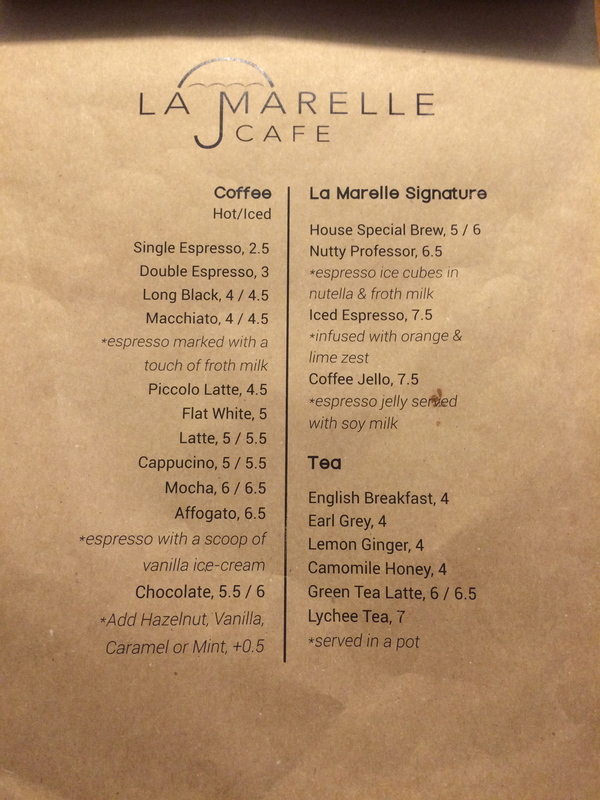 The place we decided on was La Marelle. I mean who DOESN’T love all-day breakfast! YUM. I LOVE halloumi cheese!! Why is baguette not spelled correctly? Here are some photos of the decor of the place. 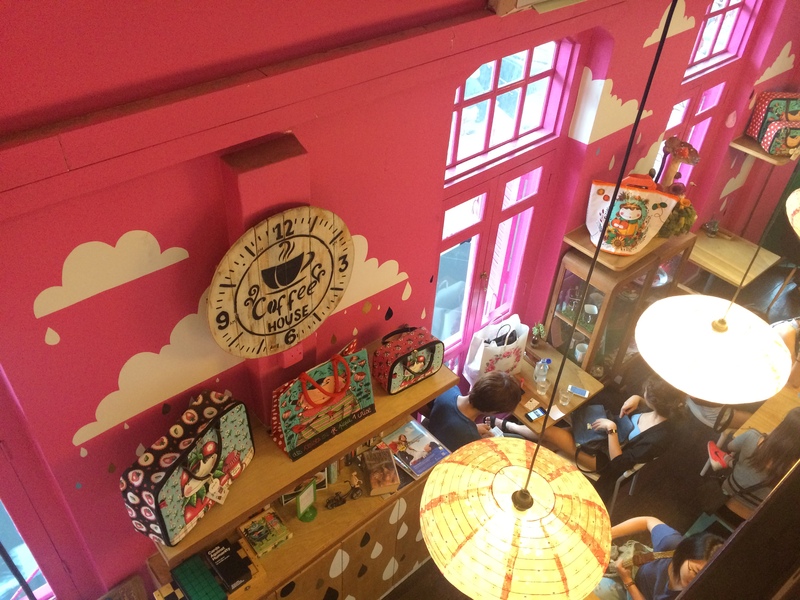 The cafe comprises two levels, located on the second and third floors of a typical Arab St shophouse. The acoustics are pretty terrible especially if you have a big group on the third floor – it gets really loud and you’ll have trouble hearing your friends! View of the main dining floor from above! Very trippy and whimsical. It’s like an Alice tea party! They sell miscellaneous goods and sundry in the cafe too, which is pretty cute. You can look around while waiting for your order! Orders are placed and paid for at the counter on the main floor, so the prices you see on the menu are actually nett prices. Yay to no service charge! The sunny-side up and the toast were perfect, I thought. The toast was lightly toasted and the egg yolk was suitably runny and DELICIOUS. 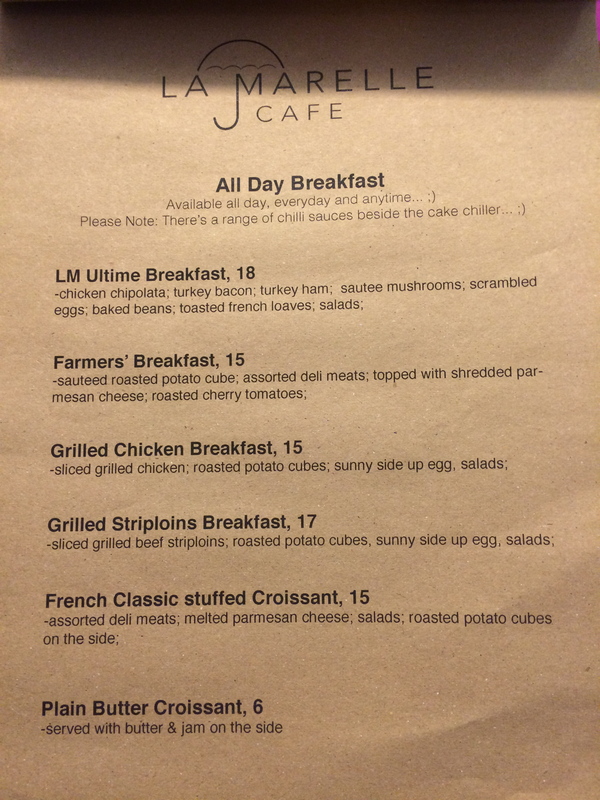 The potato cubes were not as tender as I would have liked (try the beef hash at Fika, the potato cubes absolutely melt in your mouth! ), but they tasted decent. As for the striploin pieces, I honestly have to say I thought they were a little dry. The seasoning was adequate; the meat tasted spicy/sweet at the same time, in a good way. I think the steak could have been juicier if it had been a little rarer, like maybe medium instead of medium well. I was really quite full from all the carbs and the protein, that I didn’t really touch the salad, so no comment for that! Overall, I think this dish just barely made it to 7/10. I also got myself one of the mocktails – the Peach Mojito ($8), although it also comes in lychee, mango, and strawberry flavours. This was good and very refreshing, and look at the cute coaster!! ASTAGHFIRULLAH. Haha I love the cognitive dissonance. And the surfer shark. I took some photos of what my classmates had, so you guys know what some of the other items look like! 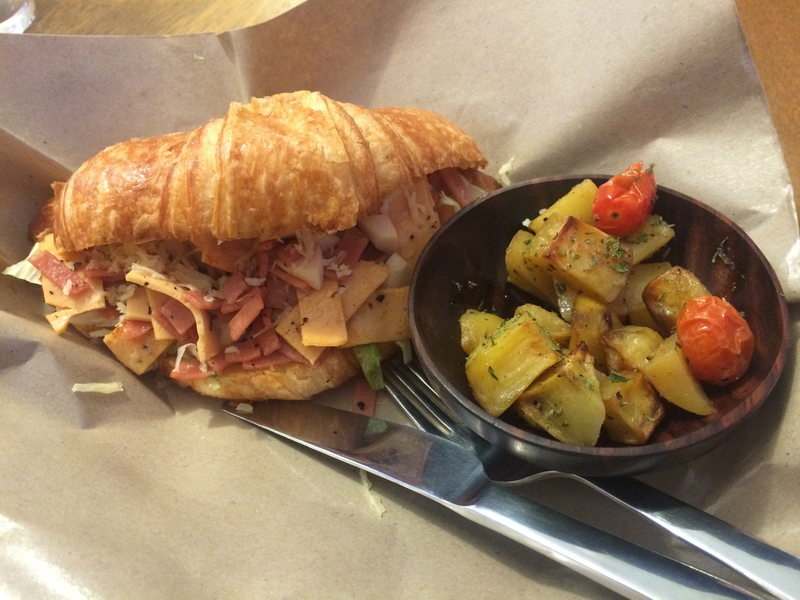 The French Classic Stuffed Croissant (S$15) with assorted deli meats and cheese in it! When reached for comment, my friend responded with “not memorable”. 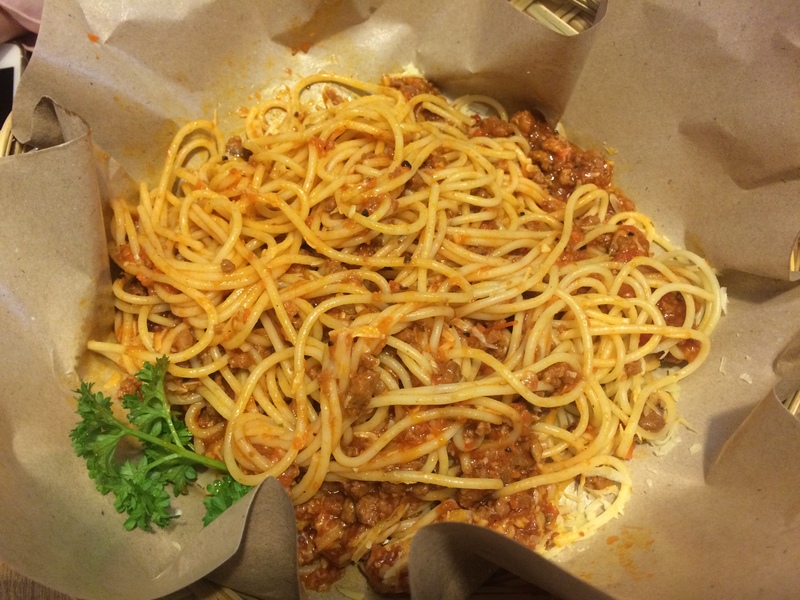 The Spaghetti Bolognaise (S$13) which came in a HUGE portion; my friend was struggling to finish it! She said this was quite plain and she got jelak after a while. 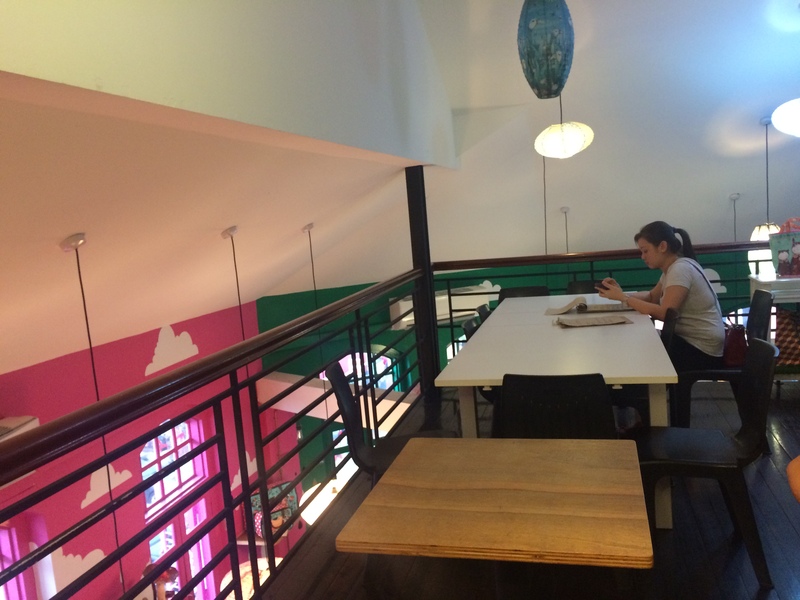 All in all I think La Marelle is one of those safe, cute cafes you can bring your friends to. The location is great, since it’s just a 1-minute walk from the Sultan Mosque. Based on what I had, I don’t think the food is amazing, which is a pity. That being said, I wouldn’t mind coming back for the decor and the location! 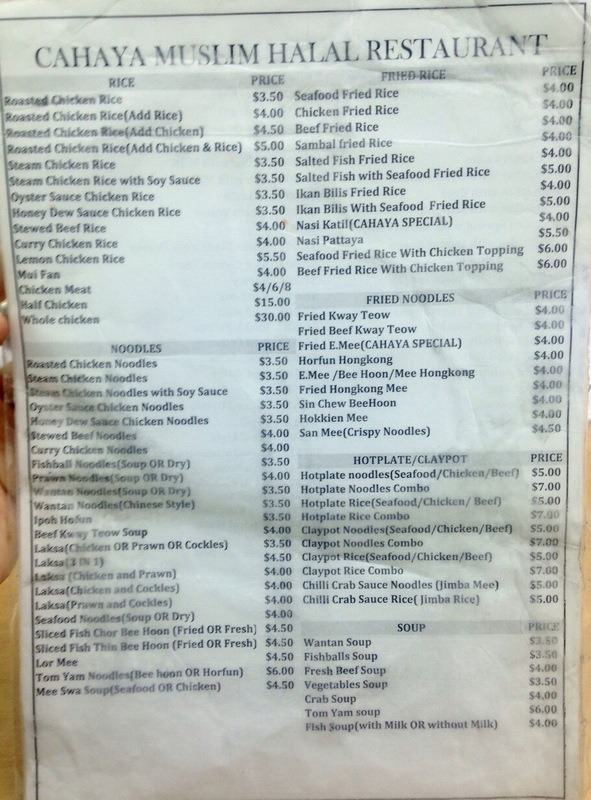 Plus, the menu is pretty extensive so I should probably try some other items, which could turn out to be really great. I first went to J’s maybe about 3 years ago, and I couldn’t remember much about the food, except that the bread and butter pudding was a little off, but that the location on Purvis Street was the best. So I finally got around to going again so I could have a more accurate and current assessment of the place. We got seated almost at the last table at the back, so I felt like a runway model stomping down the aisle. It was great. I enjoyed that they didn’t trick the place out in cheesy mexican themed decorations, like sombreros or green/white/red colourblocks. They had nice colourful chairs, but also some random colourful wall tapestries. Inexplicably, a Tree of Life tapestry on the wall. Eh, I’ll allow it! Things I like seeing on a menu: the halal sign, and JALAPENO POPPERS!!! My friend all but started hyperventilating in excitement when he saw Jalapeño Poppers (S$17), so that was an obvious starter choice for us. Mmm get in my bellayyy you plump little fatties! We also went for the Lamb Tostada (S$18), which is made up of a small crispy corn tortilla bowl sitting on a pile of sour cream, filled with slow-cooked lamb ragu, topped with melted cheese and served with some pico de gallo, which literally means rooster’s beak, but refers to a fresh salsa. I found this dish very delicious; the lamb was soft, tender, and was absolutely soaked in flavour. It reminded me a little of the Cuban dish, Ropa Vieja, which literally means old clothes, but which refers to a sort of shredded beef stew. The shredded lamb in this tostada had a sweet cheesy taste. The ragu I thought was very rich, the downside of which is that you get a little jelak/sick of it after a while, but the salsa sauce on the side helped refresh the palette. I didn’t care much for the tortilla, which I thought was not as crispy as it could have been, but I think this is a common problem you get with baked tortilla chips. This dish is a solid 8/10. We decided to share 2 mains, one of which was the Paella (S$28), a saffron rice dish with marinated chicken and not just one but TWO types of fish, salmon and tilapia. Yommehhhh. My friend and I enjoyed this tremendously. The rice was savoury, fluffy, moist, and soft. I will say here that my friend thought the rice was a little too moist, and he wanted his paella a little drier so that you have the crispy bits at the bottom. It’s a personal preference I guess – I prefer my rice moist and fluffy right to the bottom. No crispy rice bits for me! The bits that I DID love were the bits of coriander strewn around the paella; these were a delightful flavour-enhancer with every bite. The chicken was good, the tilapia I thought tasted a little fishy, and I thought the salmon was phenoms. It was so tender and flavourful! Fish is always a little tricky, but I’m glad at least for this batch that I’d gotten, the salmon was juicy and not overcooked. 9/10 for this paella! Our last item was the Beef Quesadilla (S$24) which features a soft tortilla wrap with minced beef, cheese, onions, tomatoes, bell peppers, jalapeños and some guac. All in all, I had a great time at J’s. Service was really friendly; the servers/restaurant manager seemed to be one big family. I saw the servers actually walk down the ‘runway’ looking intently at diners’ tables to see if there were any dishes to clear or water glasses to refill. Definitely a plus. I think because it’s not a typical halal cuisine, J’s would also be the perfect place for a business lunch or dinner, especially if you have Muslim clients to impress. Will definitely be coming back for more! Back when I was an angsty teen I used to go to Far East Plaza a lot with my friends after school, mostly for food and for some shopping. 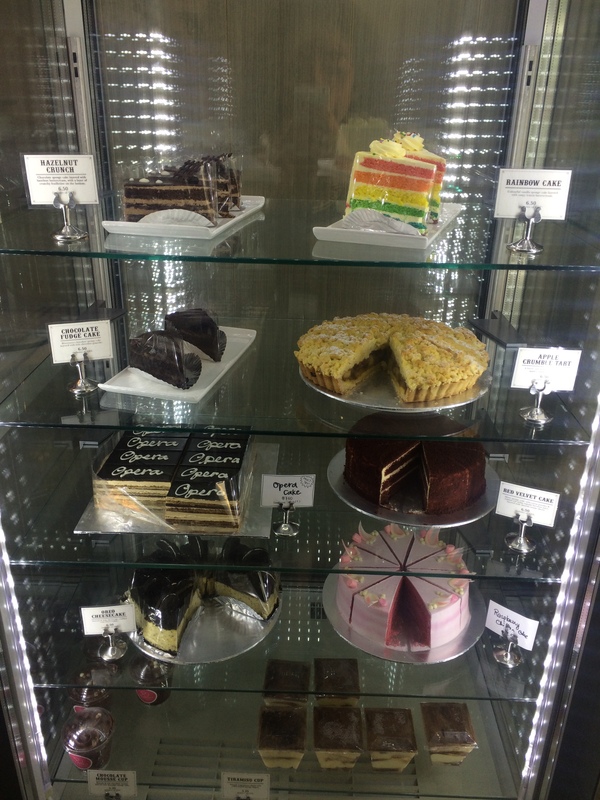 Our favourite place to eat was Dahlia’s Cafe, which used to be on the 5th floor right in front of the lifts. I would always get the Bee Hoon Bandung, which was absolutely perfect – the soup was so good and so spicy, and I swear I would spend the first 5 minutes just sipping on the broth before getting started on the noodles and the other ingredients. Yum. Unfortunately, Dahlia’s Cafe closed a couple of years ago to be replaced by some cafe I don’t even bother to remember the name of. With these old nostalgic places I tend to be a creature of habit, so whenever I’m here I always get the Beef Fried Rice With Chicken Topping (S$6), although I did go through a Chilli Crab Sauce Rice (Jimba Rice) phase a few months ago. Mmmm what’s better than chicken? Chicken AND beef!! I have to warn you guys though, the plate of wantan comes with this horrid, bitter black sauce. I’m not sure what it’s supposed to be, maybe tar, but you HAVE to ask them not to add it, since it’s a default sauce that comes with every order of wantan! There are two communal cups of sauces at each table – one is filled with this spicy, delicious chilli sauce; the kinds they serve with Hainanese chicken rice. I LOVE dipping my wantans in this sauce, and also drizzling it over my rice sometimes. It’s really very very good! 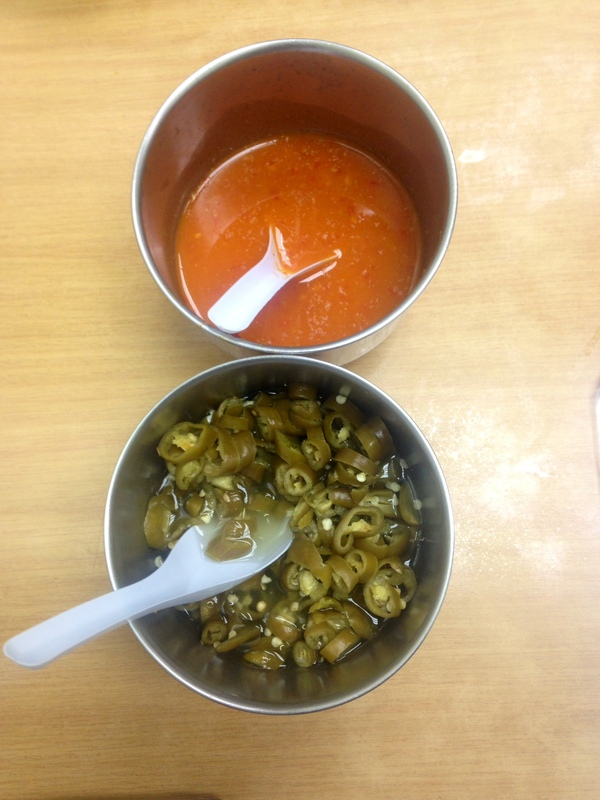 The other cup is filled with green chili in vinegar, or lada jeruk in Malay, which is not really my thang, but those who do love it will be pleased they have it here! First things first – I’m typing this review with Toploader’s Dancing In The Moonlight playing on loop in the background. Gosh, remember when it first came out in 2000? It was SO GREAT. It’s been earworming me the past couple of weeks, and as Fergie from The Black Eyed Peas coos in that one song, “I’m addicted and I just can’t get enough”. Dancing In The Moonlight is all positive vibes and happiness; it makes you feel lucky to be alive! OK to end this paean I’m gonna need you guys to take a few minutes to listen to it now! 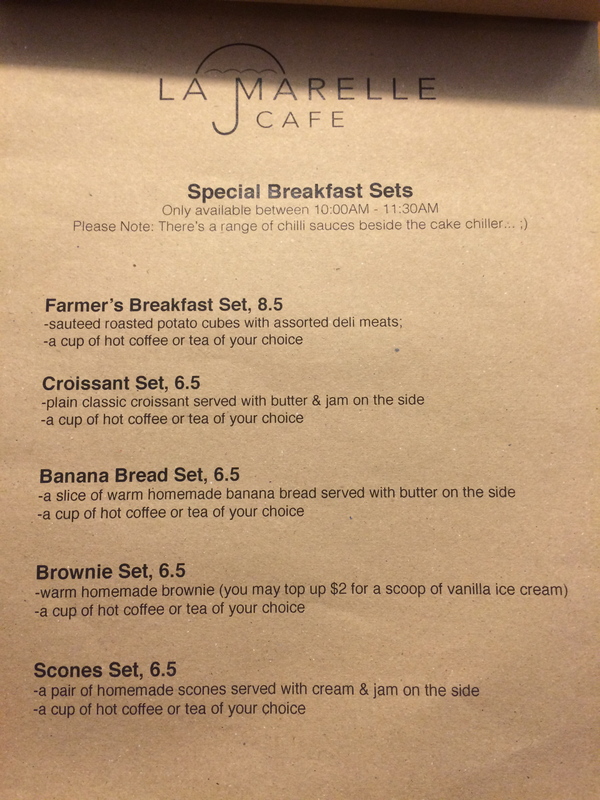 Based on their facebook page here, the cafe first opened its doors in late April 2015 as part of a soft launch, before making it official with a grand opening on 8 May 2015. Simple but beautiful table decor! Reminds me a little bit of Rouse’s. 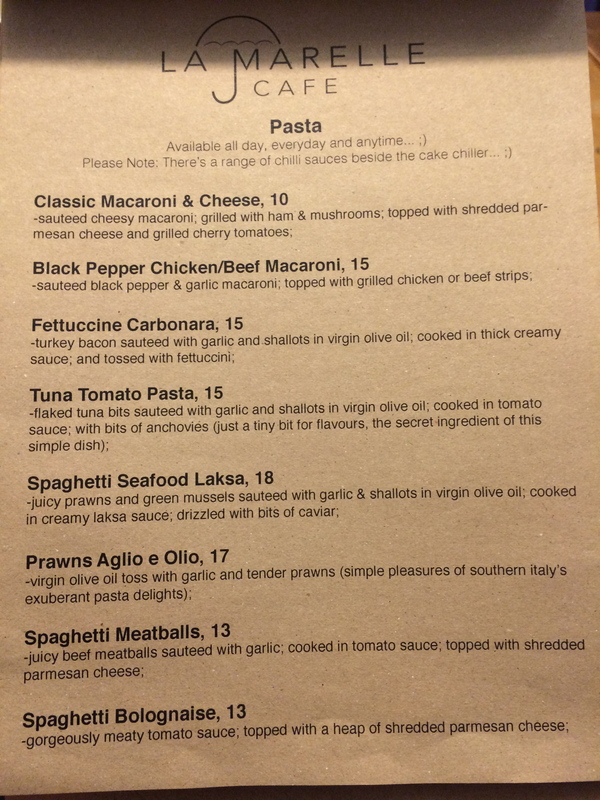 The menu at Krave is actually quite extensive, with a whole page dedicated to pasta alone, complete with a promise that the pasta will be served al dente! Cute. 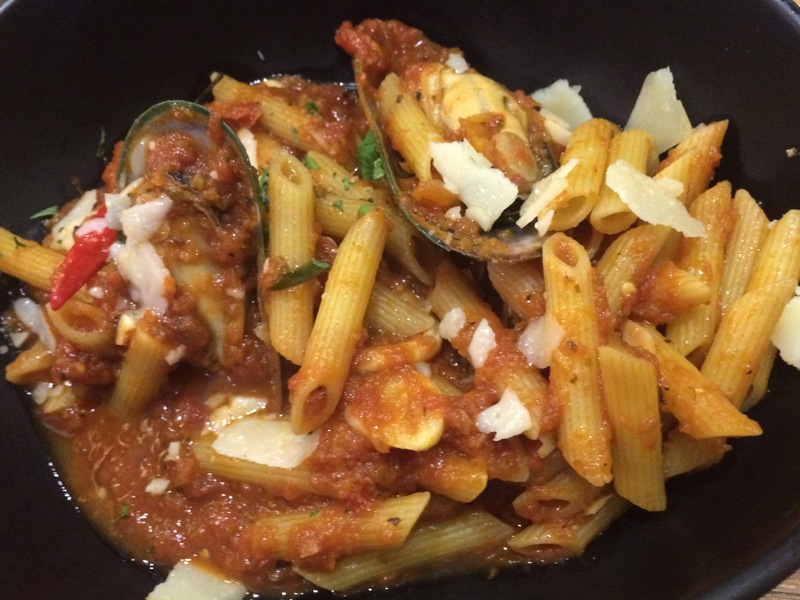 For trivia junkies, al dente is Italian for ‘to the tooth’, meaning the pasta will be firm to the bite, instead of tasting like noodles when they’re overcooked. 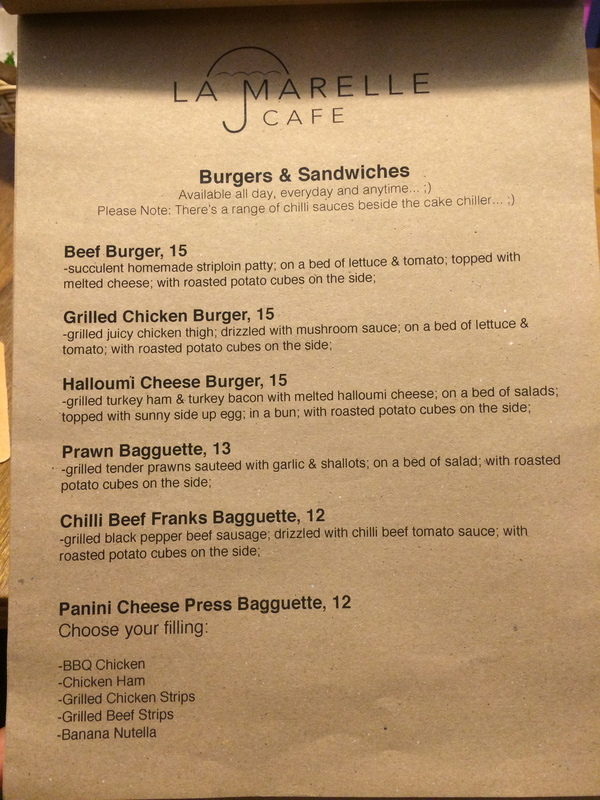 To break down the rest of the menu, there are 4 mains with 3 different types of protein (chicken, beef, salmon), 4 different pizzas, 3 salads, 7 sandwiches/toast, and literally 10 items in the dessert section. I have to admit I was really impressed with the variety in their menu. 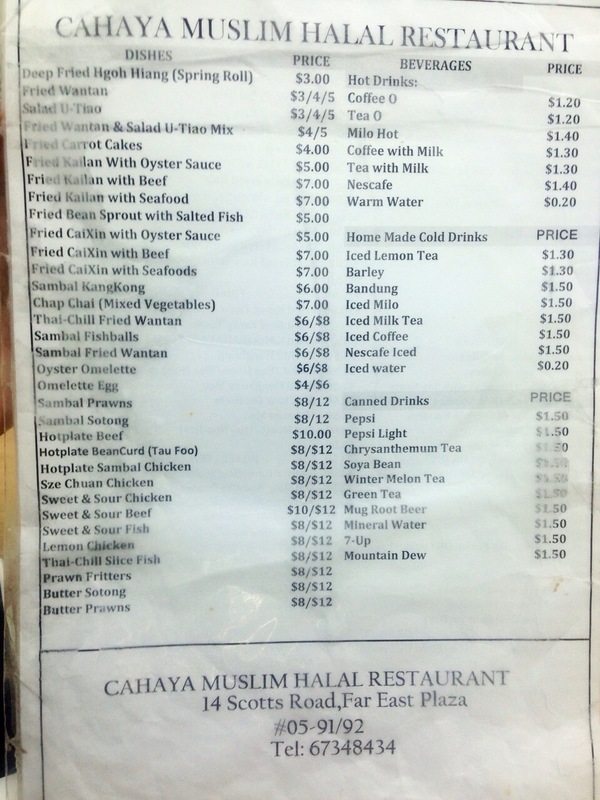 I like that they have uncommon items like the Fried Mars Bar, Mango Prawn Salad, and deep-friend Otak-otak!! Best. I was dying to try the Truffle Fries (S$12) since it comes with the works – shaved parmesan and chopped parsley! – but I decided to save it for another day, since I had my heart set on the Steak & Chips (S$20), which already comes with its own side of steak-cut fries. The meat was extra juicy, and I have to say, had ZERO tough bits, unlike the one I had at Royals Steakhouse! I mean the Royals steak was good, but Krave’s was on Krack – I felt like crying with every juicy, peppery, flavourful bite. 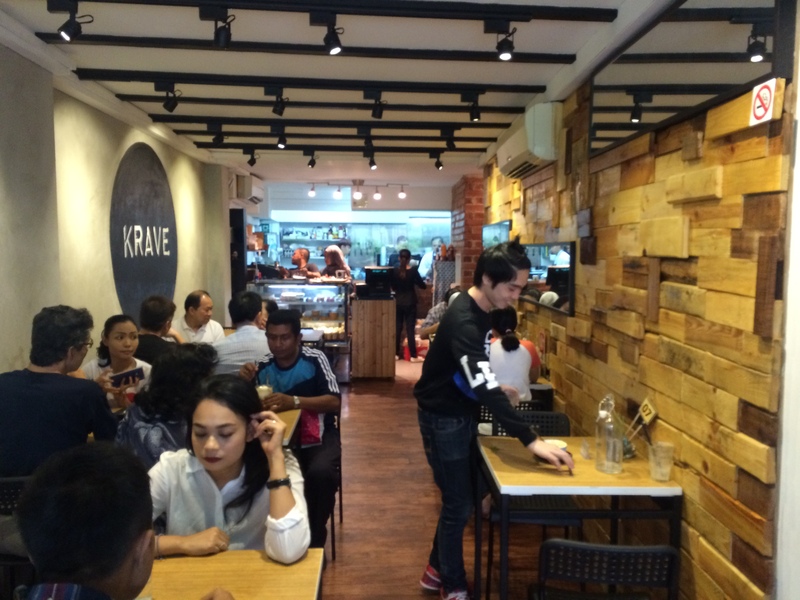 The test of a good steak is whether it’s good enough to eat on its own without any fancy sauce or accoutrements, and Krave’s passed the test in spectacular fashion. 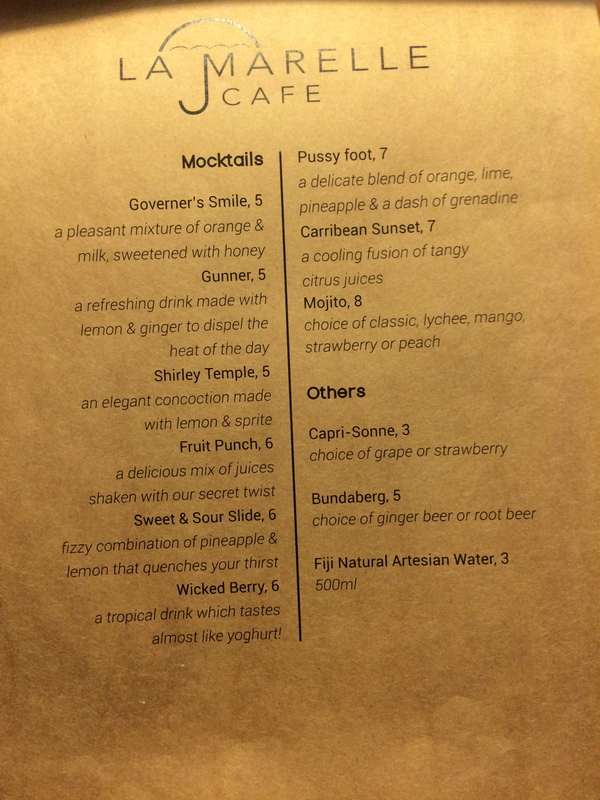 Oh, and the jus was really tasty too! I enjoyed dunking bits of meat and fries into it once in a while to change things up. 10/10 for the steak! Mmm look at those thin-crust, charred edges! My friend loved it! I had a slice, but only after I was done with my steak, so I thought while it was very tasty indeed, I also felt the pizza could have been a little juicier somehow. I think if I had had it ‘fresh’ right after serving, it would have been better. Also, I’m more of a cheesy pizza person, so I want my pizzas all extra cheesy, but objectively I think this pizza was pretty good, with that distinctive, familiar pesto taste. This scored a 7.5/10 for me. My friend also got the That Gula Melaka Drink (S$8) smoothie, which was a blend of palm sugar, coconut, and red bean. Um, IT WAS SO DELICIOUS!!! This was basically like a chendol smoothie, without the green chendol bits. So, so good. I am so partial to anything gula-melaka, so I readily bestow a 10/10 to this smoothie. 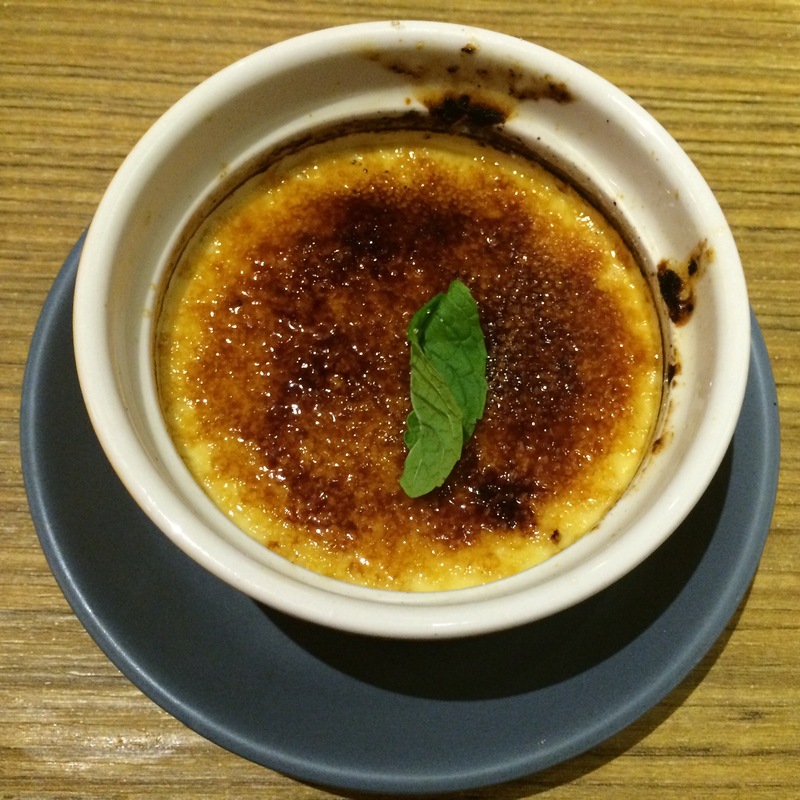 Finally, for dessert, I got the much talked-about Chempedak Crème Brûlée ($8) (oh my god it took me forever to figure out the accent keys on my Mac). 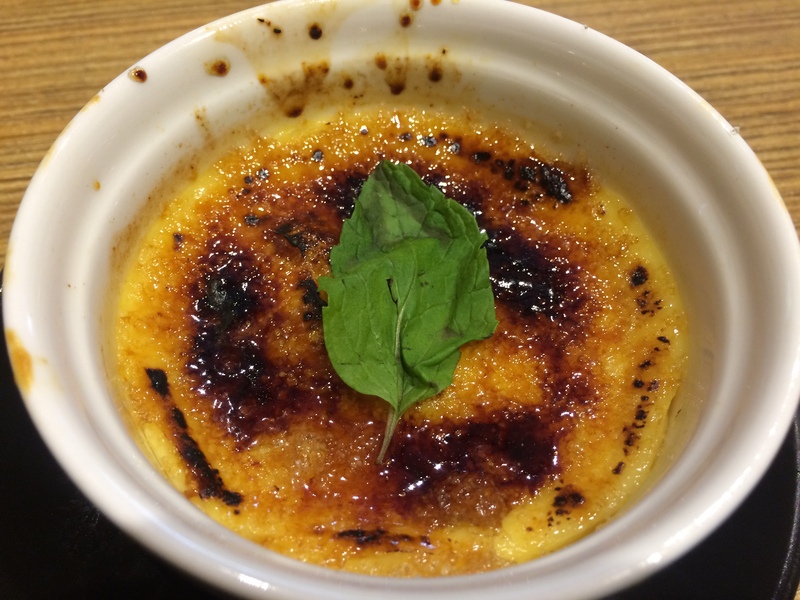 Funny story – while my friend and I were waiting for our dessert, a group of 5 walk-ins entered the cafe, with the leader of the group entreating the waiter to get them a table and promising that the group would be quick about it, as all they wanted to do was have the delicious Chempedak Crème Brûlée. How delightful! It got me really excited to taste mine. To get down to brass tacks, did the top properly crack? Well my friends, it did! I even took a crazy video of it so I could capture the sweet sound of the metal spoon cracking the hard sugar shell. I’m not going to post it here, because that would be crazy, but it was really quite heavenly. Amélie Poulain would have been so happy. All in all, Krave definitely exceeded my already-high expectations, and I left the restaurant feeling really happy and super ready to go back soon! I definitely want to try out the other things on the menu (The otak-otak! The truffle fries! The mushroom, truffle & egg pizza! etc). So hopefully I’ll get to review these other items soon! Don’t forget to make reservations by dropping them a Facebook message though – the place has limited seating and tends to fill up on Friday nights and weekends! Another thing to note is that there is no service charge or gst here; you order and pay at the counter before they serve you your food. Also, no credit cards, just cash or nets here! During the Vesak day holiday, my friends and I decided to have a girly lunch together and check out The Royals Steakhouse, a relatively new halal café/steakhouse on Jalan Pisang, near Arab Street. 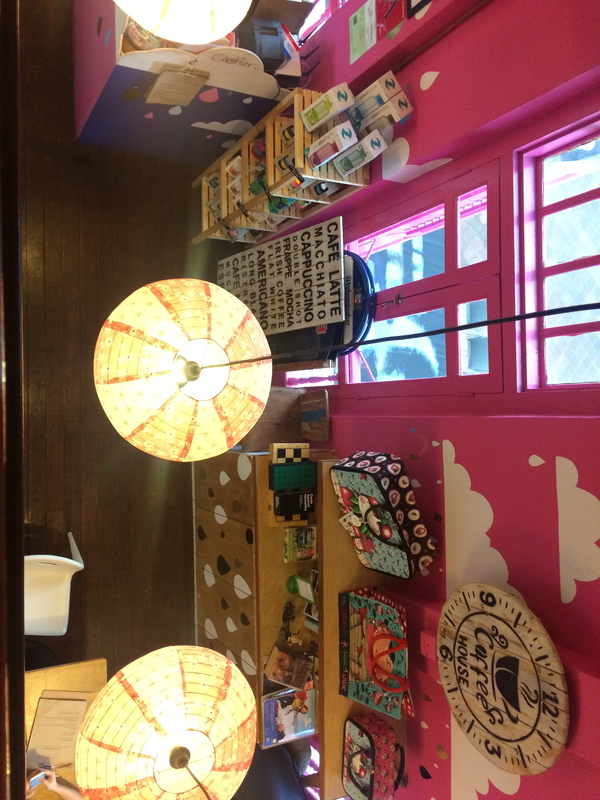 It’s a pretty small space; I dare say just slightly smaller than The Lab SG (its hipster neighbour along Jalan Pisang), and perhaps roughly the same size as the old Royz et Vous, which used to be on Bali Lane but has now moved to 137 Telok Ayer Street. The decor is pretty simple and breezy, with some old-school themed wall decorations. An anthropomorphized steak called Sir Loin!!! ADORBS. I genuinely am not acquainted with the different textures (and tastes?!) of the various cuts, but this tutorial is a good first step. We shall see, shan’t we. Open kitchen concept with bonus fire. I’m not a huge breakfast person so by the time I got to the restaurant I was ravenous and ordered two starters; the Homemade Pumpkin Soup (S$6) and the Crispy Fries (S$6). Out of sheer politeness I invited my friends to “feel free to have some!” but in my greedy heart of hearts I knew I’d want to have them ALL TO MYSELF 😦 Little did I know, I needn’t have worried, as the portions are way generous! The pumpkin soup was SO GOOD! It’s got just the right consistency – rich, creamy, and of perfect thickness so you can savour it in your mouth before swallowing. The taste was also spot on, slightly sweet and salty at the same time. UGH perfect. I’m not a fan of croutons in my soups, but my friends had them and said they tasted good, so I guess that’s a bonus too. 10/10 for the pumpkin soup! For my main, I had the Australian Striploin (S$22) in medium, served with a side salad, grilled Roma tomato, and your choice of either caramelised onion sauce, black pepper sauce, or mushroom sauce. Superb! I went with the reliable black pepper sauce, although next time I would like to try the other sauces. The meat had some parts that were tough, but the rest was perfectly done – I had requested for a medium, on a scale of rare, medium rare, medium, medium done, and well done. The meat was fresh, tender, and savoury enough with its own juices (and what I assume was maybe butter). There were also bits of fat that were just SO tasty and nicely charred. The salad though, I did not touch, so no thoughts on that, apart from that I would have preferred a side of fries or mash, instead of them greens! #roadtoheartdisease Overall, 8.5/10 for the steak! Interestingly enough, the meat dish also came with a trio of condiments – fresh cut chilli padi, freshly milled black pepper, and some rock salt. According to our waiter, they serve these condiments on the side because they want us to (a) really taste the freshness and the quality of the meat, and (b) be able to adjust the taste of the meat to our liking. Definitely a plus point for me! Baked Potato (S$3.50), served with sour cream and beef bacon bits! I didn’t taste this but my friends said it was decent. Caesar Salad With Herb Croutons, Egg, & Smoked Salmon (S$8). I didn’t taste this either but the portion looks generous! All in all I’d say this place is definitely worth repeat visits. Service was very attentive and patient, although I have to say we were one of two parties present at the time. The food is hearty, tasty, and served in decent portions. A bonus feature is that you don’t have to order and pay at the counter like at some places in the neighbourhood like The Lab SG and Working Title. It’s full-service so you can bring friends and family for a good time! Speaking of family; my friend brought her 1-year-old daughter to the restaurant and they provided her with a cute frisbee-like plate made of plastic, along with a plastic spoon, for her to play with so she could feel like one of the adults at the table! It was adorable. So feel free to bring your kids here, guys! It’s a family-friendly establishment!